All Crochet Hooks SHIP FREE to USA addresses. See option below for Canadian addresses. 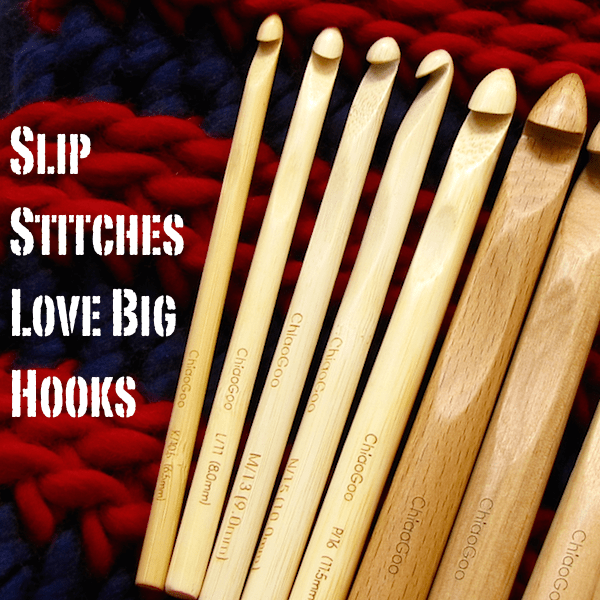 These larger polished bamboo crochet hooks have their size permanently laser marked on each hook. They are lightweight and have a nicely tapered in-line hook head, with a precisely placed finger hold for comfort in your hand. These crochet hooks are imported from China by a family-owned company in Michigan. ChiaoGoo has cheerfully sponsored my crochet classes for years. Choose from five sizes, K (6.5 mm) through P (11.5 mm), in the drop-down menu below. Looking for jumbo hook sizes Q through U (15mm – 25mm)? How about the 7 mm gap size? We have those too. The free shipping makes this a good price on these 100% bamboo Tunisian crochet hooks (a.k.a. afghan hook). ChiaoGoo hooks are carved from the strongest bamboo of all, Moso: it has the tensile strength of steel! They’re imported from China by a family-owned company in Michigan. ChiaoGoo has cheerfully sponsored my crochet classes for years. This hook is perfect for most of my students because it’s light weight, light colored, and carved in an all-purpose shape. Bamboo hooks are 60% lighter than aluminum hooks of the same size. The surface offers students some control over the thin, slippery luxury yarns I tend to use for my airy Tunisian designs. My ChiaoGoo hooks get even better with age as they acquire a soft patina. The 9-inch (23 cm) length of this crochet hook is a convenient size for two reasons. First, because it holds enough stitch loops on it to crochet several of my Tunisian shawl designs. (An advantage when using the thinner yarns for lacy drape.) 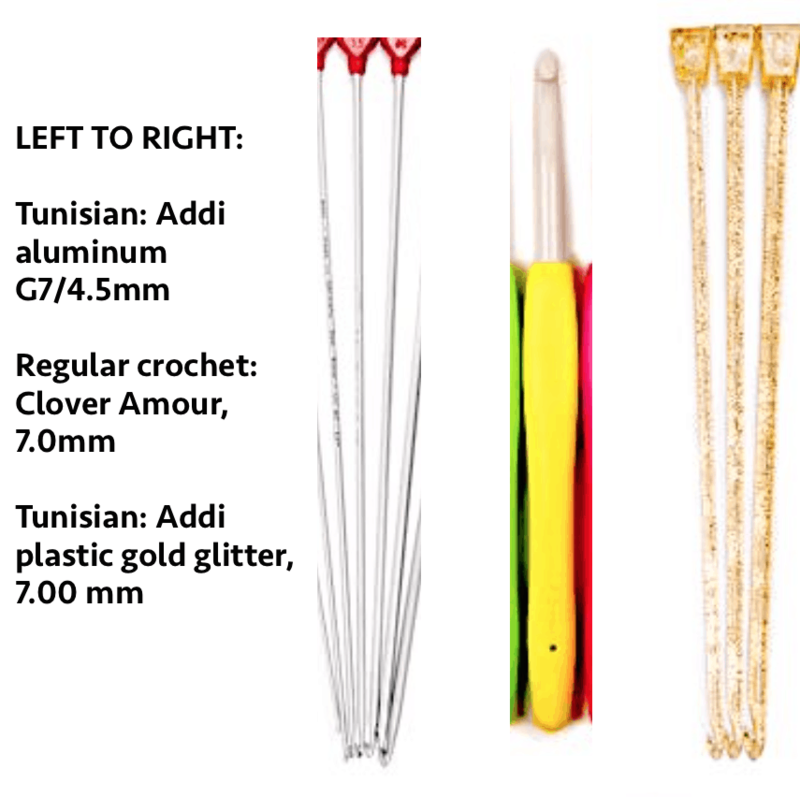 Scroll to the bottom to see which crochet patterns call for this Tunisian crochet hook length. Second, because it’s only a bit longer than “regular” (non-Tunisian) crochet hooks. I often reach for one of these for regular crochet if my shorter hooks are not at hand. As with other Tunisian (afghan) hooks, this hook does not have a thumb rest, and includes a knob on the end to keep stitch loops from sliding off. I don’t find the knob to be heavy or intrusive. ChiaoGoo hooks are carved from the strongest bamboo of all, Moso: it has the tensile strength of steel. They’re imported from China by a family-owned company in Michigan. ChiaoGoo has cheerfully sponsored my crochet classes for years. The free shipping makes this a good price on these crochet hooks by ChiaoGoo. 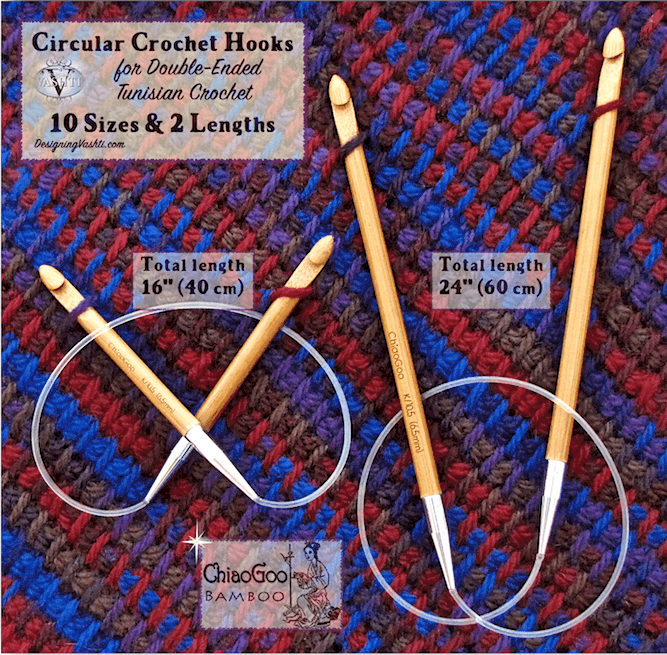 Double-ended circular hooks are used for a fun variation of Tunisian crochet. It involves using two different balls of yarn, and turning at the end of the row. It’s known as Double-Ended Crochet, Cro-Hook, Crochenit, Cro-knitting, and Crochet on the Double™. Among double-ended crochet designs, our Mesmer Veils is unique! All crochet hook sizes are not equal—equally available, that is. Crochet hook sizing standards vary a bit among countries and brands. For example, in the US the standard girth of a K hook is 6.5 mm. In other countries the standard may be 7 mm instead. The next larger hook, size L, is 8 mm, so there’s quite a gap between our standard American K (6.5 mm) and L (8 mm) sizes. Why does this gap matter? The 6.5 mm hook size is often great with yarn that has a novelty texture. It’s also great when you want to use a standard medium weight yarn (a.k.a. “afghan yarn”) for slip stitch crochet, and other stitch types that really shine with a looser gauge. Sometimes the 6.5 mm size is sometimes not quite big enough, but an L/8 mm is just too big. Some US sizes like the G-7 (4.5 mm) can be surprisingly hard to find as Tunisian and double-ended hooks. We’re fortunate to be able to offer these lesser-common hook sizes. Straight Tunisian 4.5 mm 11″ (28 cm) long by Addi of Germany. It’s made of aluminum and has a red heart shaped stopper. Straight Tunisian 7 mm hook 11″ (28 cm) long by Addi of Germany. It’s made of clear acrylic with gold glitter with a numbered knob on the end. This 11″ length is halfway between the 9″ and 13″ Tunisian bamboo hooks we have in the 6.5 mm size. Regular 7 mm crochet hook, 6″ (15.2 cm) long by Clover of Japan. It’s a coated aluminum with a bright yellow handle. 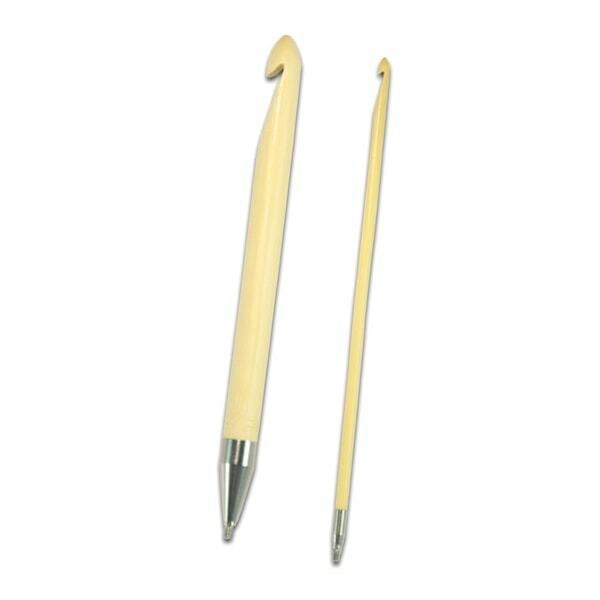 We have the 6.5 mm regular crochet hooks in bamboo here. See all of our single crochet hooks here. Elsewhere in the shop we have other US standard 6.5 mm regular hooks: Tulip gold Etimo, Tulip Rose aluminum, and ChiaoGoo bamboo. Each hook is 5.7” (14.5cm) long. This means you can also use it as a regular crochet hook (for non-Tunisian crochet). Size is permanently laser marked on each hook. Hook heads are pointy for quickly crocheting into the right stitch loop. Made of Moso bamboo with a nice finish: warm, no drag. Join is stainless steel and the connections are secure. Smooth transitions. Compatible with the SPIN cables in ChiaoGoo’s knitting needle sets. ChiaoGoo makes the bamboo Tunisian crochet hooks I’ve used in my Tunisian classes and have carried in the shop for years.